This funky mushroom is widespread in North America, and can be found on the dead wood of hardwoods or, occasionally, conifers. Its typical form is a classic example of what mycologists call an "effused-reflexed" fruiting body; it spreads its spore-bearing surface over the wood and musters up just enough cap-making umph to fold over its upper edge into a slight extension. 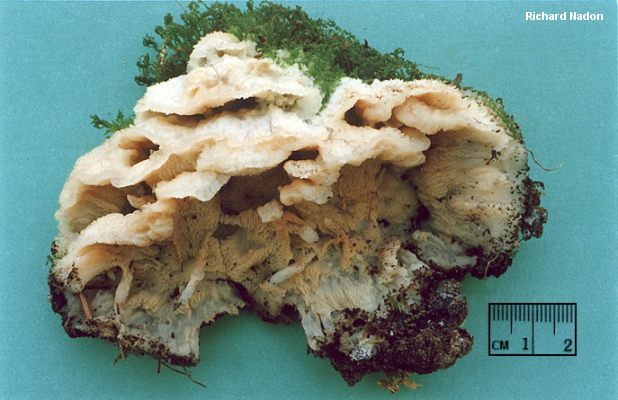 Other distinguishing features include the translucent, orangish to pinkish spore-bearing surface, which develops deep folds and pockets; the whitish, hairy upper edge; and microscopic features (see below). 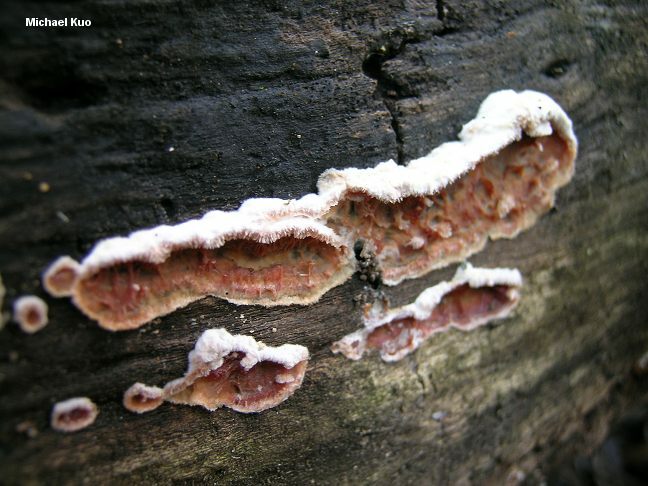 Ecology: Saprobic; growing alone to gregariously, sometimes in overlapping clusters; found primarily on the dead wood of hardwoods but also reported on conifer wood; causing a white rot; annual; late spring, summer and fall (over winter in warmer climates); widely distributed in North America. 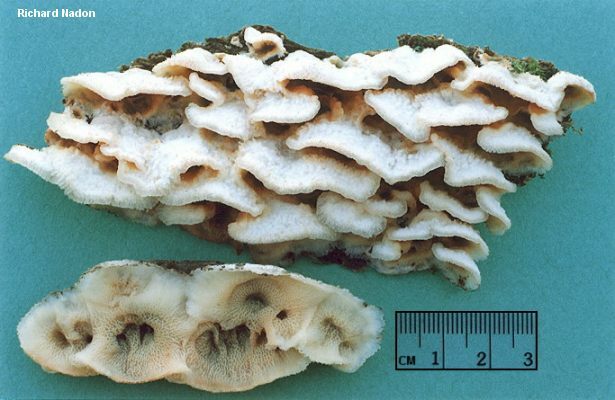 Fruiting Body: 3-10 cm across; irregularly shaped; resupinate except for a stubby upper edge; upper surface where developed woolly and whitish; without a stem; up to about 5 mm thick. Undersurface: Translucent; often somewhat gelatinous; orangish to pinkish, or orange to red when mature; elaborately wrinkled and pocketed, giving the illusion of being irregularly poroid. Microscopic Features: Spores 3.5-4.5 x 1-2 µ; smooth; sausage-shaped; inamyloid; biguttulate in KOH. Cystidia scattered; clavate; scarcely projecting; apices often incrusted. REFERENCES: (Schrader, 1794) Nakasone & Burdsall, 1984. (Fries, 1821; Saccardo, 1888; Ginns, 1976; Nakasone & Burdsall, 1984; Breitenbach & Kränzlin, 1986; Lincoff, 1992; Barron, 1999; McNeil, 2006; Miller & Miller, 2006; Binion et al., 2008.) Herb. Kuo 11120501. Merulius tremellosus is a synonym. 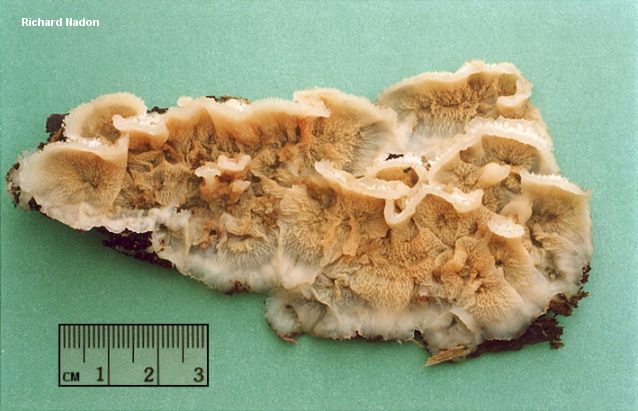 "Phlebia tremellosus" is a mistake in Latin agreement. Nakasone & Burdsall (1984) transfered Merulius tremellosus to Phlebia on the basis of morphology and culture studies. More recently, Moncalvo and collaborators (2002) present DNA data supporting the idea that the genus Phlebia is probably polyphyletic (containing unrelated species), but includes a central group of species, including Phlebia tremellosa and the type species of the genus, Phlebia radiata, that clearly belong together in what will now have to be a more restricted Phlebia.